I’ll share a little secret with you. Every week I buy one or more of these. It’s organic greens already washed and ready to eat. 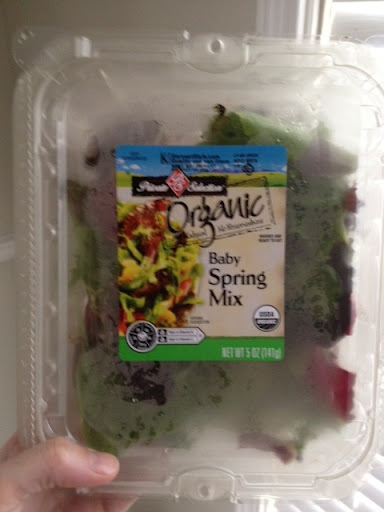 I LOVE the baby spring mix which includes red romaine, tango, arugula, red leaf, green romaine, green and red chard red mustard, frisee, radicchio, spinach and more. Almost every day for lunch, I have a salad (my current favorite dressing is jalapeno ranch) and this makes it so easy. No washing, no cutting and it’s all organic. I also throw it on anything I can think of to add a little crunch and some extra vitamins… tacos, hamburgers, sandwiches, etc. Easy as can be!